ROME --- Leonardo has completed series of successful test flights of its Falco EVO Remotely-Piloted Air System (RPAS) in Bulgaria. The flight campaign was to validate a package of upgrades that extends the endurance and operational range of the platform for overland and maritime missions. This includes a Beyond-Line-Of-Sight (BLOS) satellite data-link system and a new propulsion system based on a heavy-fuel engine. As well as extending the flight envelope of the Falco EVO, the new engine was also proven to generate more electricity on-board the platform, granting access to more power-intensive ISR sensors required for complex missions. Further trials are now planned that will see the Falco EVO flying equipped with Leonardo’s new Gabbiano TS Ultra-Light (UL) surveillance radar (launched at the Paris Air Show in 2017) combined with a high-definition InfraRed (IR) electro-optical system, Automatic Identification System, and a comms relay suite. The Falco EVO, the longest-endurance model from Leonardo’s Falco RPAS family, is a surveillance and intelligence-gathering platform suited to overland and maritime missions. It can fly for more than 20 hours while carrying a payload of up to 100 kg. The Falco EVO has already been delivered to its launch customer in the Middle East region, while the original Falco RPAS has been chosen by five customers. The Falco EVO is currently engaged in a selection process for a prestigious international client and will shortly be deployed in the Mediterranean for a European surveillance programme. More than 50 Falco family RPAS are currently engaged on operations around the world. 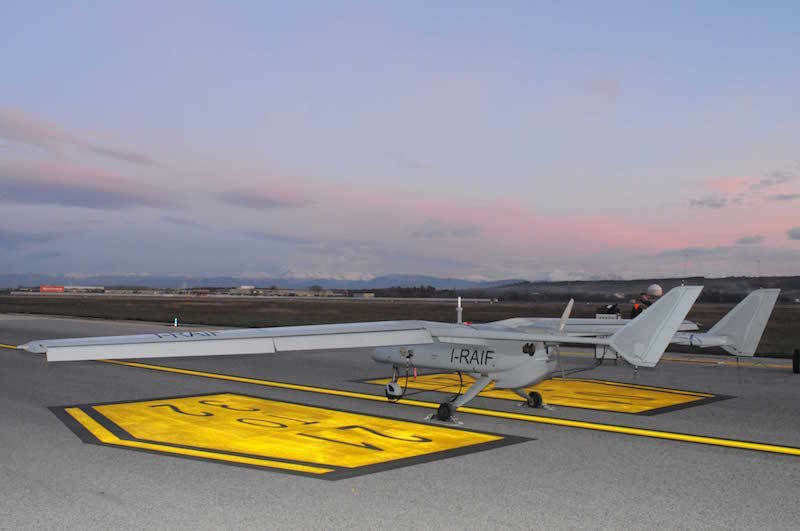 Some customers choose to own and operate Falco family platforms while others, such as the United Nations for its humanitarian MONUSCO mission, have selected Leonardo to deliver a managed service package. Under this kind of arrangement, Leonardo owns and operates the Falco and provides surveillance information directly to the customer. This ‘managed service’ model is expected to be a growth area for Leonardo which is expanding its ‘drones as a service’ offering, including to civilian customers such as police and emergency responders.